Both editions of the iconic and moving Christmas story, this is a 2-film box set of Christmas spirit for the whole family. Looking for the perfect Christmas movie? Why not two? A double bill featuring the original 'Miracle On 34th Street' and the 1994 remake. In 'Miracle On 34th Street' (1947), Doris Walker (Maureen O'Hara), an executive at Macy's department store, believes in taking a common-sense approach to life and is consequently raising her daughter Susan (Natalie Wood) not to believe in Santa Claus. This year, however, the convictions of both mother and child are challenged when the kindly old man (Edmund Gwenn) hired as the store Santa insists that he is in fact the real thing. No one believes him, some even think he's insane, but he is willing to go to court to prove his case. In 'Miracle On 34th Street' (1994), a girl, Susan (Mara Wilson), confides in Kris Kringle (Richard Attenborough), the kindly old man who is acting as the grotto Santa in the department store managed by her mother. Kris Kringle believes he is the genuine Santa Claus and this devotion to the cause makes him very popular indeed, leading to record profits for the store. This annoys rival retailers so much that they try to discredit the so-called Santa, leading eventually to a court case in which Kringle and his lawyer try to prove that he is the real thing. 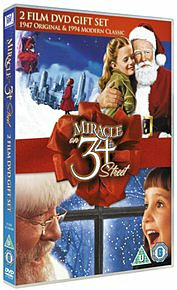 Miracle on 34th Street 2 DVD Box Set is published by 20th Century Fox and is our 23917th best seller. The ISBN for Miracle on 34th Street 2 DVD Box Set is 5039036055635. Be the first to review Miracle on 34th Street 2 DVD Box Set! Got a question? No problem! Just click here to ask us about Miracle on 34th Street 2 DVD Box Set.